Carolyn Jones covers math and science education for EdSource. She was a reporter for 17 years at the San Francisco Chronicle, where she covered the environment, Oakland city hall and other beats. 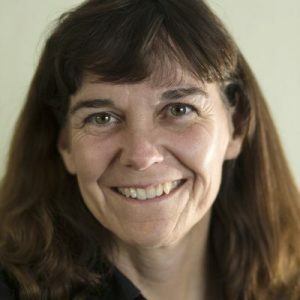 She received the 2011 Harold Gilliam Award for Excellence in Environmental Reporting for stories about the economic impact of environmental restoration, as well as numerous awards for feature writing from the East Bay Press Club. She also covered health care for the Oakland Tribune and education for both the Hayward Daily Review and Sonora Union Democrat. She has a B.A. from UC Berkeley in English and lives in Oakland with her two kids. Scores rose 8 points after teachers took a course designed to improve their own knowledge. Native Californian history should include more than just 4th-grade mission projects, some teachers say. New data from the Office of Civil Rights shows wide gaps in advanced math and science enrollment. The report by the National Council of Teachers of Mathematics report calls for an end to tracking, and more practical course offerings. New taxes would subsidize child care for low- and middle-income families. Low-income and low-performing schools are facing the most obstacles in implementing the Next Generation Science Standards. Music can help students remember math formulas and relieve stress in the classroom, studies show. A UCLA survey of 730 schools nationwide found widespread negative impacts related to deportation fears. More than 50,000 U.S.-born students in California have Salvadoran parents who had temporary protected status. A new report ranks California among the nation's worst in teaching about student loans, credit cards and personal finance. Computer Science Education Week part of a broad effort to prepare young people for jobs and diversify the tech field. Teachers say they're spending hundreds out of pocket to pay for science experiment supplies. An Education Trust-West study found wide achievement gaps, even though Latino students make up a majority of students. New state data shows 46 percent drop in school suspensions over the last five years. The suspension rate for African American students in 2016-17 was 9.8 percent, for Latino students 3.7 percent, for white students 3.2 percent, and for Asian students 1.1 percent. Third-graders, the first class taught according to Common Core standards since kindergarten, show the biggest gains. Tears, stress and absenteeism are increasingly common among immigrant students, teachers say. UC President Janet Napolitano seeks to stop the reversal of the program she helped create. Undocumented students will continue to be welcome at UC, CSU and community colleges, education leaders say. Definitions of “sanctuary” vary from district to district, but in most cases it means that school staff will not allow federal immigration agents on campus without a warrant, subpoena or court order. Hidden Genius Project, among others, provides free programming classes to underrepresented groups. A new AP Computer Science Principles class focuses on the “big ideas” behind computer science. Five Keys Charter School's refurbished bus will help high school dropouts earn their diplomas or GEDs. The Technovation contest is one of many summer programs aimed at encouraging girls to pursue math and computer science. Nonprofit organizations like Save the Frogs are helping schools implement California's new science standards. The state's fourth-largest school district is among the leaders in finding creative ways to staff classrooms. After 20 years on the job, a fiscal analyst begins a new career as a high school teacher. Statewide efforts to increase the number of math and science teachers have had some impact. Former engineer makes the transition to high school teacher. The bill would require a committee of educators, librarians and media experts to create guidelines for teachers. Thousands of low-income students get to see the Broadway show for free as part of the EduHam history program. Computer-based exam based on Next Generation Science Standards to be given through June. Nearly 60 California school districts have declared themselves safe havens for undocumented immigrants. Those who are participating say it's important to fight funding cuts to science agencies and education. Next Generation Science Standards aim to reach minorities, English learners and others underrepresented in science fields. State law requires schools to have comprehensive safety plans. Teacher support and high-quality materials are key, according to a new report. Some schools are replacing asphalt play yards with trees, flowers, and vegetables. Girls score the same as boys on math and science tests, but women make up only 29 percent of the STEM workforce. The chancellor's statement is the latest salvo in colleges' protest of federal immigration policies. As prices come down, more schools are using high-tech headsets to supplement science lessons. New standards, among the most comprehensive in the nation, focus on human impacts. More school districts vow to protect immigrant students despite threats from the Trump administration. Teachers, administrators and parents object to DeVos’ positions promoting charter schools and vouchers. The approach encourages hands-on learning through experiments. In some cases, English learners outscored their English-proficient peers on standardized tests.